Almost 90 years ago, the creation of two iconic golf courses – Le Touquet Golf Resort’s La Mer (The Sea) and Golf d’Hardelot’s Les Pins (The Pines) – triggered a golden age of golf travel for France’s Channel-facing Côte d’Opale. Today, thanks to painstaking restoration work that has seen both courses returned to their original glory and prompted unprecedented climbs in a respected ranking of Europe’s top 100 courses, the region is preparing for another. Colt & Alison’s classic La Mer layout and Tom Simpson’s stunning Les Pins were opened within months of each other in 1931, just as the town of Le Touquet was gaining a reputation not only as Europe’s most fashionable resort but also an elite sporting playground for the rich and famous. 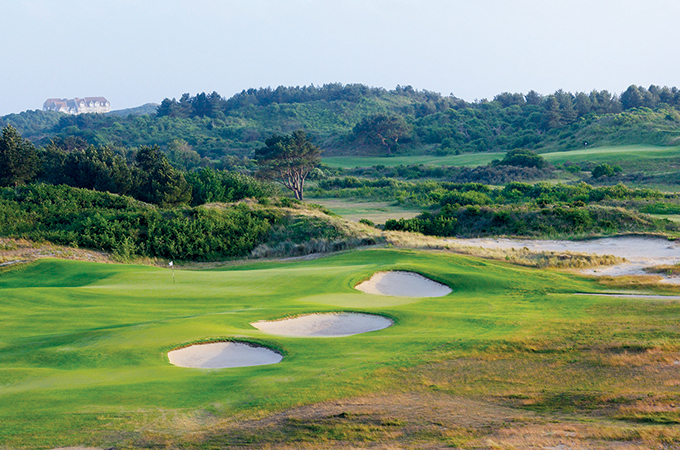 Occupying the dramatic terrain between the Côte d’Opale’s expansive duneland and swathes of pine forest, the two courses remain the star attractions of Le Touquet Golf Resort and Golf d’Hardelot, two premier resorts sitting just 12 miles apart in France’s northernmost department, Pas-de-Calais. Both courses quickly won plaudits for their ability to charm and challenge in equal measure. And after their recent successful restorations by golf architects Patrice Boissonnas and Frank Pont, they continue to do so; both La Mer, France’s #1 links, and Les Pins have climbed significantly in the 2018-2019 ranking of Continental Europe’s top 100 courses by influential online listing top100golfcourses.com. Le Touquet Golf Resort’s La Mer climbed 21 places to finish 35th, securing a top 10 position within the country’s best layouts, while Golf d’Hardelot’s Les Pins became the new rankings’ highest-rising course, jumping 36 places to #23 – and securing 7th in the country listing. Le manoir hotel at Le Touquet Golf Resort has been voted Best Golf Hotel/Resort in France by readers of Today’s Golfer magazine, for the second successive year. The award comes as the 41-room residence entered into the final phase of a comprehensive upgrade, designed to transform it into a boutique style hotel. This renovation is now complete.